SOUTH BEND, Ind. Notre Dame said a story that star Manti Te'o's girlfriend had died of leukemia  a loss he said inspired him all season and helped him lead the Irish to the BCS title game  turned out to be a hoax apparently perpetrated against the linebacker. Notre Dame Fighting Irish Athletic Director Jack Swarbrick held a press conference late Wednesday about the apparent hoax Wednesday after Deadspin.com said it could find no record that Lennay Kekua ever existed. "This was a very elaborate, very sophisticated hoax perpetrated for reasons we can't fully understand," Swarbrick said. CBS News and its morning program, "CBS This Morning," were among the many news outlets that reported on the "hoax" girlfriend's death. "CBS This Morning" will have an update on the report Thursday. The Notre Dame athletic director insisted "several things" led him to believe Te'o did not create the girlfriend himself after the university's investigation into the situation, led by a private investigative firm. "Manti was the victim of that hoax. He has to carry that with him for a while. 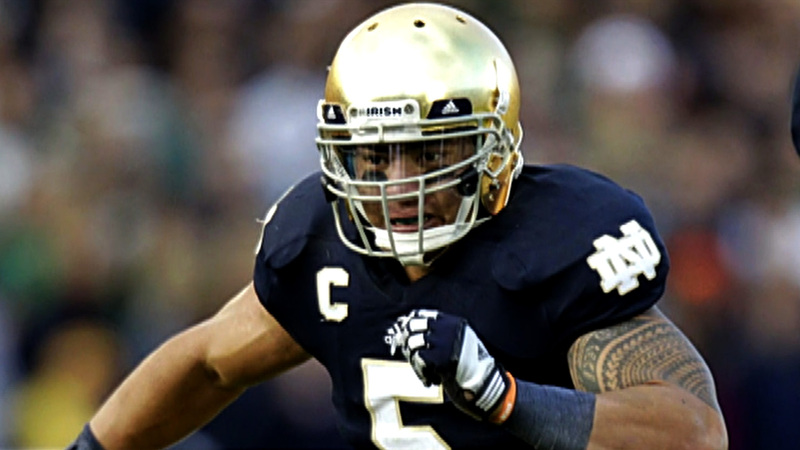 In many ways, Manti was the perfect mark because he's the guy who was so willing to believe in others," Swarbrick said. "The pain was real. The grieving was real. The affection was real." By Te'o's own account, she was an "online" girlfriend. "This is incredibly embarrassing to talk about, but over an extended period of time, I developed an emotional relationship with a woman I met online. We maintained what I thought to be an authentic relationship by communicating frequently online and on the phone, and I grew to care deeply about her," he said in statement. "To realize that I was the victim of what was apparently someone's sick joke and constant lies was, and is, painful and humiliating." "In retrospect, I obviously should have been much more cautious. If anything good comes of this, I hope it is that others will be far more guarded when they engage with people online than I was." The linebacker's father, Brian Te'o, said in a telephone interview with The Associated Press in early October that he and his wife had never met Kekua, saying they were hoping to meet her at the Wake Forest game in November. The father said he believed the relationship was just beginning to get serious when she died. Swarbrick likened the situation to the 2010 movie "Catfish," in which "young filmmakers document their colleague's budding online friendship" with an allegedly young woman that turns out also to be a hoax. The university said its coaches were informed by Te'o and his parents on Dec. 26 that Te'o had been the victim of what appeared to be a hoax. Someone using a fictitious name "apparently ingratiated herself with Manti and then conspired with others to lead him to believe she had tragically died of leukemia," the school said. Swarbrick said the investigation revealed "several" perpetrators, although the exact number is unclear. He said the university became convinced of the hoax based on "the joy they were taking...referring to what they accomplished and what they had done." Te'o talked freely about the relationship after her supposed death and how much she meant to him. In a story that appeared in the South Bend Tribune on Oct. 12, Manti's father, Brian, recounted a story about how his son and Kekua met after Notre Dame had played at Stanford in 2009. Brian Te'o also told the newspaper that Kekua had visited Hawaii and the met with his son. Brian Te'o told the AP in an interview in October that he and his wife had never met Manti's girlfriend but they had hoped to at the Wake Forest game in November. The father said he believed the relationship was just beginning to get serious when she died. The week before Notre Dame played Michigan State on Sept. 15, coach Brian Kelly told reporters when asked that Te'o's grandmother and a friend had died. Te'o didn't miss the game. He said Kekua had told him not to miss a game if she died. Te'o turned in one of his best performances of the season in the 20-3 victory in East Lansing, and his playing through heartache became a prominent theme during the Irish's undefeated regular season. "My family and my girlfriend's family have received so much love and support from the Notre Dame family," he said after that game. "Michigan State fans showed some love. And it goes to show that people understand that football is just a game, and it's a game that we play, and we have fun doing it. But at the end of the day, what matters is the people who are around you, and family. I appreciate all the love and support that everybody's given my family and my girlfriend's family." Te'o went on the become a Heisman Trophy finalist, finishing second in the voting, and leading Notre Dame to its first appearance in the BCS championship. He was asked again about his girlfriend on Jan. 3 prior to the BCS title game, saying: "This team is very special to me, and the guys on it have always been there for me, through the good times and the bad times. I rarely have a quiet time to myself because I always have somebody calling me, asking, `Do you want to go to the movies?' Coach is always calling me asking me, `Are you OK? Do you need anything?'" Four days ago Te'o posted on his Twitter account: "Can't wait to start training with the guys! Workin to be the best! The grind continues! (hash)Future"
Te'o's statement also said: "It further pains me that the grief I felt and the sympathies expressed to me at the time of my grandmother's death in September were in any way deepened by what I believed to be another significant loss in my life.